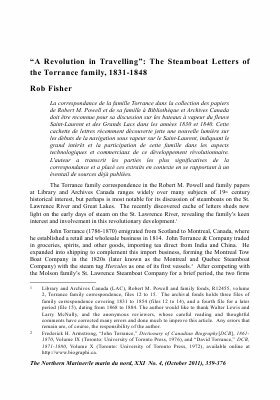 The Torrance family's correspondence in the collection of papers by Robert M. Powell and his family at Library and Archives Canada must be recognized for his discussion of the steamboats of the St. Lawrence River and the Great Lakes in the 1830s and 1840s. This recently discovered cache of letters sheds new light on the beginnings of steam navigation on the St. Lawrence, indicating the great interest and involvement of this family in the technological and commercial aspects of this revolutionary development. The author transcribed the most significant parts of the correspondence and places these excerpts in context by referring to a range of previously published sources.